Tom Daley, a British diver who won bronze at the London Olympic Games in 2012, has become the latest athlete to publicly declare his sexual orientation. In a YouTube video designed to end "rumors and speculation," Daley announced that he is indeed gay. "Come spring this year my life changed massively when I met someone and they made me feel so happy, so safe and everything just feels great -- and that someone is a guy," said Daley. "Of course I still fancy girls but right now I'm dating a guy and I couldn't be happier." Daley, age 19, tried to head off the inevitable backlash: "In an ideal world I wouldn't be doing this video because it shouldn't matter, but recently I was misquoted in an interview and it made me feel really angry and frustrated, and emotions that I've never felt before when reading something about myself, and for me honesty is something that I really do believe in." 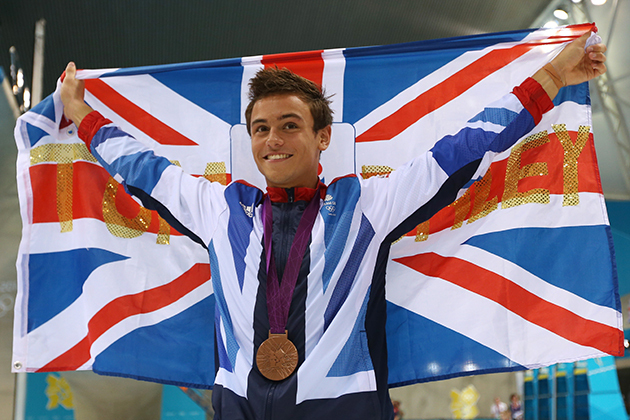 Daley won bronze in the 10-meter dive at the London Olympics, and hopes to compete in Rio in 2016. He remains a popular figure in England.